On June 7, my daughter, Jacquie, flew from Wisconsin to California to visit with us for a few days and to ride back with us in our motorhome. On the morning of Friday, June 11, 2004, we embarked on our five-week journey! Our first sightseeing stop was the International UFO Museum and Research Center in Roswell, New Mexico. The primary focus of the museum is to inform the public about what has come to be know as "The Roswell Incident" in 1947. (If you are unfamiliar with this story, another good source is the 1994 movie "Roswell," starring Martin Sheen.) The museum is fun and interesting; it contains copies of all the newspaper articles about the crash and numerous signed affidavits of people who were involved with the aftermath in various ways, as well as a myriad of other UFO-related things. 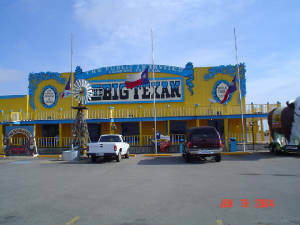 Our next stop-over was Amarillo, Texas; Fred was looking forward to eating dinner at the well-known restaurant, The Big Texan. They offer a free 72-ounce steak if it's eaten within one hour. Needless to say, neither of us ordered that, but it is a fun restaurant where a trio of wandering musician/singers entertain diners. The restaurant also offered door-to-door limousine service that we took advantage ofquite nice! 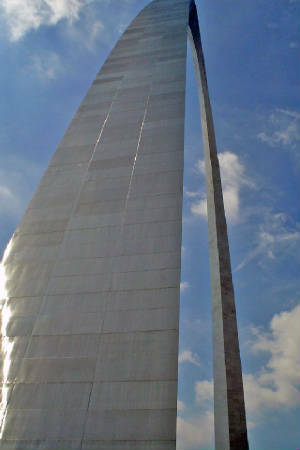 Our next sightseeing stop was The Gateway Arch in St. Louis, Missouri. 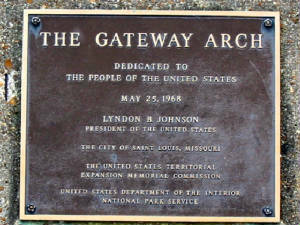 The complete and correct title is the Jefferson National Expansion Memorial, which consists of The Gateway Arch, the Museum of Westward Expansion, and St. Louis' Old Courthouse. Below the arch is the Museum of Westward Expansion, which houses a large collection of artifacts, animal specimens, authentic American Indian tipi, and an overview of the Lewis and Clark expedition that began in St. Louis on the Missouri River. We saw two movies there: "Monument To The Dream" that documents the construction of the arch. The second movie, "Lewis & Clark: Great Journey West," was shown in their Odyssey Theater with a four-story-high screen and THX sound. It made you feel like you were right there! This photo is only one of many that were taken from the top of the arch. The river can be seen from one side, while part of downtown can be seen from the other.